Phoenix Contracting Services provide minor service load calculations, one-line diagrams, feeder calculations, fault calculations and panel schedules. Phoenix Contracting Services provides electrical service load calculations up to 400Amps, electrical one-line diagrams, electrical feeder calculations, electrical panel calculations, electrical fault calculations and electrical panel schedules as prescribed per the National Electrical Code NFPA 70. We have an electrical designer and electrical inspector in-house to expedite your design and can help you obtain your electrical permit. We also provide third party electrical engineering for larger projects upon request. As a separate service, we aid in the collection of electrical data necessary for engineers to create reports for power monitoring, arc flash and selective coordination studies. Whether it is a branch circuit, electrical feeder, or main electrical service, a good electrical installation should always have some form of approved load calculations performed and code conformity observed to ensure the electrical system design is safe and of sufficient capacity to carry the designed load. What is an Electrical Load Calculation & Why do I need one? The purpose of an electrical load calculation is to accurately determine if the electrical service and its feeders are of sufficient capacity to carry the calculated load shown, whether it is on a residential, commercial or industrial project. The National Electrical Code is the basis we use to ensure an electrical service is sized properly and installed correctly. In the electrical field, there are many things that can go wrong, some of which are costly while others could be dangerous. So as a rule, always check references such as Google or the BBB before hiring an electrical contractor. These professionals should be licensed, experienced and have the ability to clearly share any deficiencies they find in your electrical system. Phoenix Contracting Services is your one stop shop when it comes to Electrical Load Calculation Services. We work on all brands of electrical equipment for example Square D, Siemens, Cutler Hammer, Eaton, Westinghouse, Crouse Hinds, Murray, Zinsco, Federal Pacific to name a few. We have an electrical designer in house as well as electrical engineering availability upon request if needed. We can take care of all scheduling and coordination of your utilities and municipalities, all you have to do is ask. If we can’t repair it, we can replace it. 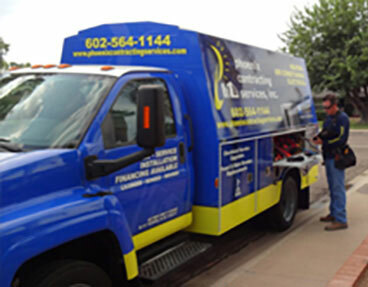 We have been doing business with Phoenix Contracting Services since 2010. Jeff, Josh and the rest of their crew have always been great!! They are very knowledgeable and professional while at the same time being personable and taking the time to know us. They have always been very responsive to my calls, texts, and emails even after hours! I would never hesitate to pass out their business cards to anyone looking for quality work!! I have been exceptionally pleased with the work done by Phoenix Contracting Services. It is consistently excellent. One of the best parts of their service is their attitude. It is one of wanting to do their best for you and to know what else they can do while they are there. They always offer sound advice and great service. And if they need to come back to finish something that they ran out of time to do, it is usually within 24 hours, something unheard of in this area. Jeff, Josh, and all the crew of Phoenix Contracting did an excellent job on our extensive remodel. They are honest, timely, and do excellent work. Above all we wanted a contractor we could trust and Jeff Finley is the best of the best! Our remodel turned out even better than we had imagined. Highly recommend this company. Outstanding job! Phoenix Contracting Services is awesome. They came out on time and just provided us with top notch service. They installed an outside system and also did some major ductwork in the attic. Our attic is super tight and hard to work in but they were able to be up there working nonstop. Everyone was professional, accommodating, and worked on our house like it was their own. I’m so glad to have found them and would recommend them highly. Phoenix Contracting Services, we wanted to thank you for your help in restoring power after the storm. In the face of an inane county inspection requirement from the power company, we weren’t sure how many hoops we were going to have to jump through. But you made the process as quickly and easily as we ever could have hoped. We greatly appreciate your professionalism, speed and compassion. Thanks again.